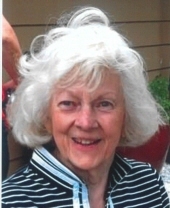 PEORIA – Mary LaWeir Lochbaum, 91, of Peoria, died after a long battle with Alzheimer’s disease on March 31, 2019, at Buehler Home in Peoria. Mary was born on June 21, 1927, in Middletown, IL, to John and Nellie (Allison) Anderson. She married Edward “Bud” Lochbaum on June 13, 1947; he preceded her in death on December 3, 1969, in Peoria. She was also preceded in death by her parents; 2 step-daughters, 1 step-son; 2 brothers; and 2 sisters. Mary is survived by her stepson, Gerald Lochbaum of Peoria; her 3 daughters, Judy (Jon) Steffens of Wapella, IL, Kathy Dougherty of Peoria, and Cindy (James) Janovetz of Peoria; many beloved grandchildren and great-grandchildren; and several nieces and nephews. Mary was a proud graduate of Manual High School in Peoria. She attended Bradley University and graduated with an Associate’s Degree from I.C.C. Mary was a revenue agent and accountant for the I.R.S. for many years. She was a lifelong member of the former Arcadia Avenue Presbyterian Church in Peoria. Mary was a former member of Peoria Jubilee Business and Professional Women and the Daughters of the American Revolution. A funeral service will be held at 11:00 a.m. on Friday, April 5, 2019, at The Wilton Mortuary in Peoria. A visitation will be held on Thursday, April 4, from 5 to 7 p.m. at the mortuary and one hour prior to the services at the mortuary on Friday, April 5. Cremation rites will be accorded. A burial of ashes will take place at Parkview Cemetery at a later date. Memorial donations may be made to the Peoria Humane Society, T.A.P.S. No Kill Animal Shelter, or other animal welfare service you prefer. The family would like to extend a special thank you to the staff at Buehler Home for their wonderful care and kindness. "Email Address" would like to share the life celebration of Mary LaWeir Lochbaum. Click on the "link" to go to share a favorite memory or leave a condolence message for the family.